Special Friends: Ring-Along, Sing-Along! is a children's musical video from 1991. It is the final video in the Special Friends series of kids musical videos, which have now become popular on YouTube. The series consists of three videos - Special Friends Starring 'You On Kazoo', made in 1989, Special Friends: Let's Sing-Along! 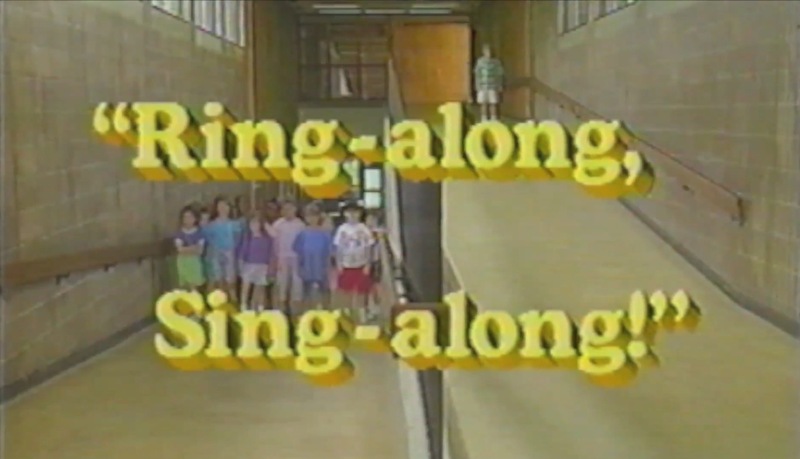 made in 1990, and Special Friends: Ring-Along, Sing-Along! made in 1991. The VHS tapes were produced by the Melissa & Doug toy company, and would be sold bundled with the appropriate instrument - You On Kazoo came with a kazoo, Let's Sing-Along came with a fake microphone, while Ring-Along, Sing-Along came with jingle bells. The Special Friends tapes did not have much of a plot. The beginnings of all three tapes usually began with some children waiting for Brett to play with them. At the beginning Ring Along, Sing Along, Brett is standing on a railway, and his playmates are standing on another railway below him. Brett wonders where the kids are, and his playmates wonder where he is. This stretches out into a three-minute sequence. After still saying "I don't see the kids, do you? ", Brett finally walks over to the camera, addressing the audience and saying "But I did find someone riiigghht over here!" In these tapes, after Brett would address the audience, he would say something like "You know what? I think we're going to be friends. Special Friends." In Ring Along, Sing Along, after crawling to a turn in the railway, Brett finally finds the kids, and they all go outside. They sing and dance, sing a song about skipping, and imitate various vehicles, such as a train, and a fire engine (where one kid would imitate shooting a gun). The kids all go inside and sing a song about ringing their bells, and then they would start dancing in time to the music. After dancing, Brett tells the viewer he wants to tell him/her something secret. He then says that he is glad to play the viewer, and once more calls the viewer his "Special Friend". Brett sings a recurring special song just for the viewer, "Special Friends". The song concludes and the credits roll. The first two videos in the series had already been recorded from VHS tapes and uploaded to YouTube in their entirety. The third video was brought to attention during a Reddit AMA with the main star of the Special Friends series, Brett Ambler when he was asked if there were more Special Friends videos. According to Ambler, "there are actually three videos out there. [...] The last one was called Ring-Along, Sing-Along! and came with jingle bells. I don't remember much of that one. But it's out there somewhere." Soon after, a user by the name of 143books in the same thread found out there was a listing for the videotape at the Chicago Public Library. Another user by the name of Kirioko placed that tape on hold and also found listings for the same tape in Dodge City, KS, Hugoton, KS, Mandan, ND, and Jacksonville, FL. However, he later received a message from the Chicago Public Library, which stated that the "request for [Ring-Along Sing-Along had] been cancelled because: All copies [were] charged/traced/lost." Then, on February 25th, 2018, a new YouTube channel called Special Friend was created. It then uploaded Ring-Along, Sing-Along! in its entirety. The uploader turned out to be Emily Shornick, one of the children in Ring-Along, Sing-Along! (the first child introduced, a girl with a pink shirt), who had gotten a digital copy of the tape from an anonymous fan. A video promo featuring the box art for all 3 tapes.